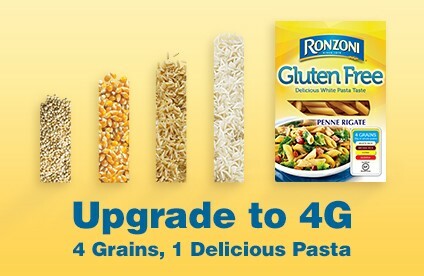 Gluten-Free Living > Blog > Food > SPONSORED POST: Upgrade to 4G. 4 Grains, 1 Delicious Pasta. SPONSORED POST: Upgrade to 4G. 4 Grains, 1 Delicious Pasta. Unlike other gluten free pastas, Ronzoni® Gluten Free is made from a unique 4 grain blend: white rice, brown rice, corn and quinoa. For a taste that’s every bit as good as regular pasta. It’s sure to get a great reception in your home. Find Ronzoni Gluten Free FAQs, recipes and more at https://www.ronzoni.com/en-us/content/31135/GlutenFree.aspx.